If you are in the process of buying chairs for your office, then you should first know the different types of office chairs. Since there are many types of office chairs, it may be very hard to choose which of them will perfectly fit your needs. For this reason, here are some of the various types of office chairs and their corresponding descriptions. You might have seen these big chairs used by the big bosses of the company. Executive chairs are made with high-quality materials. Some executive chairs are even made of leather. The most prominent characteristic of an executive chair is its higher-than-usual backrest with a corresponding headrest. Since it is a swivel chair, it can be reclined for napping or resting. Its height is adjustable, too, to accommodate a more comfortable sitting position. Its name is derived from its appearance and the material used to cover the chair’s seat. Mesh is like a net, and its greatest advantage is that it can offer a cool sitting experience. Because of its tiny holes, air can easily circulate and reach the user. Mesh office chairs are best used in tropical places or in warm environments. Because of this, the user will be more comfortable, which often results in increased work efficiency. ESD chairs are used to effectively ward of static electricity. You might have experienced minute electrocution because of static energy, and this can be very startling and annoying. With ESD office chairs, you do not have to suffer from the effects of static electricity. Through specially designed mechanisms, the electric discharge is dispelled through the backrest to the floor. The word “ergonomic” may sound fancy to you, but it basically means that the chair is designed to improve posture. When people design ergonomic chairs, they keep in mind the relationship of the user and his or her environment. Thus, ergonomic chairs are very comfortable. They can significantly decrease work-related back pain and muscle strain. Over past few years the principle of ergonomics has not just been applied to chairs, but to other office equipment as well. This type of chair is usually used in conference meetings. It is made with good-quality material, though not good enough to be on par with executive office chairs. It has caster wheels for easy transportation. Conference office chairs are designed to provide optimum comfort because they are used for very long periods of time. They can also be reclined to an adjustable height. This is the most versatile type of chair and can be used for many different purposes. It is simple yet very functional. It does not have any wheels and is not meant to be moved from one place to another very often. 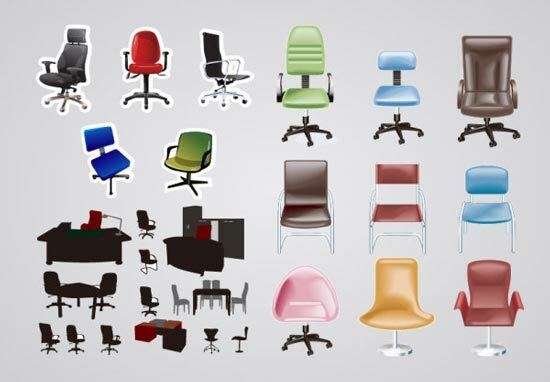 These are just some of the different types of office chairs. Now that you know your options, it is time for you to make the right choice.